I bet cheese prices in Ubersreik are through the roof. Alright, so Warhammer End Times - Vermintide is centered around you dealing with a rat infestation. These bucktooth squatters are all up in your place of residence making everything diseased and covered in teeth marks. I guess it is worth mentioning that these rats are about 5 feet tall, humanoid, intelligent, and more than happy to fill you with sword and spear-shaped holes. And by your place of residence, I mean an entire city named Ubersreik. Also, there's actually an entire species of them called the Skaven, and they've been doing this since your grandpappy was a small child playing "Find the Rusty Dagger" in some muddy Bretonnian fields. So, how do you deal with this kind of infestation? You group up with three other half-crazed badasses and straight up murder them, that's how. Vermintide, the latest project from Fatshark Games, is a four player co-op FPS set in the already despair-filled Warhammer Fantasy universe. 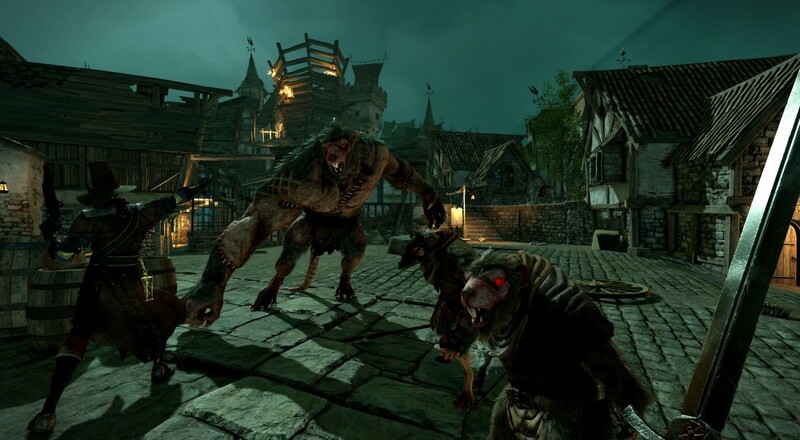 In it, players are tasked with making excursions into the besieged city of Ubersreik in an attempt to lift the Skaven's siege. Not a ton of details have been released thus far, but word on the street is that its influences range from the AI-directed hordes of Left 4 Dead to the loot acquirement of Borderlands. Vermintide won't be a walk in the park either, as the Skaven are fast, cunning, and overwhelming; so long as they're not being crushed by two-handed axes, that is. We'll be keeping you up-to-date as more information slips from Fatshark's grimy paws, especially on the 5 distinct characters that players will be able to choose from. Assuming everything goes according to plan, you'll be axing the Skaven a few questions sometime in the second half of 2015 on Xbox One, PC, and PS4. Page created in 0.2663 seconds.